Parents who choose to delay the date their child starts school are calling for equal access to funding for an extra year at nursery. Children in Scotland usually go to school in the year they turn five. Parents of those born in January and February can apply for deferral, which is automatically granted. Those with August to December birthdays can also apply, but this is at the discretion of the local authority. 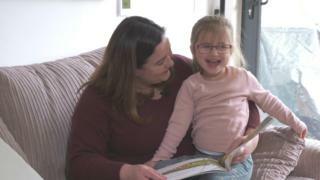 Funding for that extra year at nursery also varies so campaigners want the Scottish government to make the access equal. MSPs are due to debate the issue in the next few weeks. Emma Winchester's daughter Cara won't turn five until November. Emma, from Aberdeen, thinks she's not quite ready to start school. As a full time student, Emma relies on nursery care for Cara. Her application for continued funding for the extra year at nursery was initially refused. It's now been granted following an appeal. ''I've been honestly astonished by how removed parents are by the process. "It was very much a case that the nursery would put in a form of their opinions on your child, then a panel will discuss it without you being there. The Scottish government gives local authorities the responsibility to decide whether children - like Cara - who have an Autumn term birthday - are entitled to additional funding. But campaigners say decisions vary across the country. Patricia Anderson runs the Give Them Time campaign which wants extra funding for deferred places to be automatic. She said: "It can seem extremely unfair that some people just need to tick a box and they're granted that extra funding whereas others have to have nursery support, educational psychology, educational professionals at the councils. Henry Maitles, a professor of education at the University of the West of Scotland, says there is evidence to show that children who start school too early can struggle more than those who start later. But he says delayed starts do have an impact on classes. He told BBC Scotland News: ''In some classes in Scotland where there are primary 1/2 composites you could have kids at 4 and a half, and other kids starting school at 6 and a half, and that doesn't make for easy teaching." He said that Scotland is among a small number of countries across the world where children start at four-and-a-half. Most countries across the world start children in school at six and, in some of the most successful countries such as Sweden or Finland, they start at seven. He said: "There a number of parents who think we should be moving to a later start date." The local government body Cosla said careful consideration was given to requests to defer. It admitted in some cases information could be clearer and it is reconsidering the process. A Scottish government spokeswoman said: "Primary schools have seen a significant shift in recent years towards a play-based approach to learning, which is enshrined in the curriculum guidance that supports teachers in making sure play is a key part of the early years of primary school. "We are clear that this approach to delivering play-based learning builds on the strength of Scottish education, rather than any shift in the age at which children start school."